0.39" x 0.83" x 2.08"
Pros: Sent it through the washer an embarrasing number of times. It still works! Great capacity. Cons: Real world transfer rates top out at 300 MB/s. Other Thoughts: This drive is great! Have had to intsall Windows and Linux on my machine a few times and this thing mad it a breeze. Even made updating my mobos buggy version bearable. You never know when power goes out, and it only has to happen ONCE. 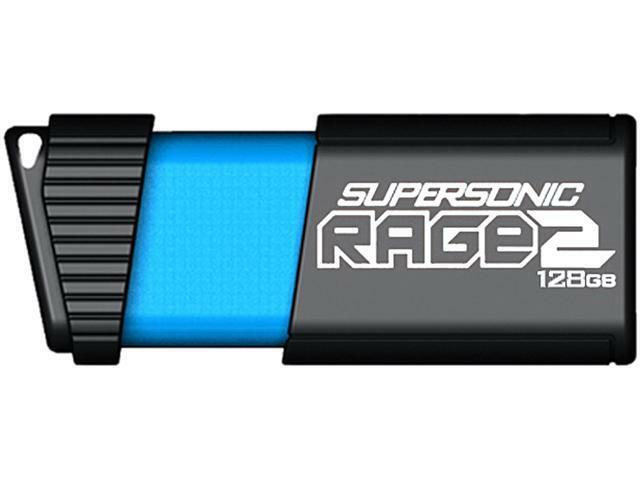 Cons: The Rage 2 128GB USB 3.1 Drive is showing as 32GB. This is inexcusable. Other Thoughts: If anyone is having this issue and there is a quick fix, let me know. If not, I'm returning the product. The reduction in total space most often occurs after a user loads an image to a USB. This can be solved by using Patriot Memory's own Low Level Format Tool. You can contact our Technical Support department for a copy of it. They can be reached at support@patriotmem.com. Pros: It's a little pricey, but you're paying for the speed, and this drive is much faster than most of them. If you're copying around multiple gigs of data, this thing will save you a ton of time. I mean, I bought a generic 64GB drive from a store for $6, and the sequential write speed is something like an order of magnitude slower than this one, and the read speed is out of this world. Cons: This is just a personal thing, so YMMV, but I'm not fond of the drives that retract the connector. Not taking an egg off, because it's strictly a subjective complaint. Other Thoughts: I would strongly recommend this drive to people who care about a having a large, fast drive. Cons: The write speed is horrendous. No where near as advertised. Writes like a usb 2.0 drive. It's out of the ordinary to hear that you cannot get more than USB 2.0 speeds and feel that you should contact our Technical Support team and be walked through how to get more out of your USB flash drive. Please contact us at support@patriotmem.com. Pros: So far, so good. I have used this usb drive for about a month. I use the Ubuntu 18.04LTS operating system on my HP laptop. I use this USB drive for file backup. Previously, I was using the Lexar 128gb usb drive with the small footprint. It ran very hot and failed. I mailed it back to Lexar for replacement. A month later, they mailed me a different, larger usb drive which ALSO failed after a short time. That did it for me. No more Lexar for me. I needed backup storage which was reliable. I based my buying decision on the more than 300 positive reviews of this product. It does not get hot and seems to be very fast. Time will tell if it proves to be reliable. Cons: Since I am technologically challenged, it took me a while to figure out how to make the usb interface protrude. I thought that there was a cap to pull off. NO!!! You have to push on the end of the drive to make the interface protrude. No instructions on that. Other Thoughts: The drive is attractive and does not stick out to far from my laptop. As I said before, I am happy with this usb drive and hope that it proves to be more reliable than the last Lexar drive I had. Pros: Fast, fast drive. Like, I can edit HD video off this thing. Cons: I personally think slider-designs are gadgety and lame. But maybe they're cool. Pros: Inexpensive when i bought it. Cons: No way to buy it in newegg for about 3 months, incredibly low availability, the cap feels incredibly flimsy but the main body sturdy.